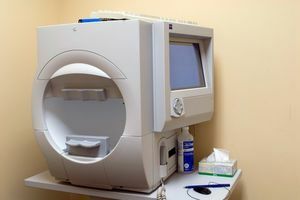 Corneal topography, also known as photokeratoscopy or videokeratography, is a non-invasive medical imaging technique we use for mapping the surface curvature of the cornea, the outer structure of the eye. The cornea is normally responsible for some 70% of the eye’s refractive power, its topography is important in determining the quality of vision. This procedure can now assist in the diagnosis and treatment of a number of conditions in planning refractive surgery such as LASIK and evaluation of its results or in assessing the fit of contact lenses. A development of keratoscopy, corneal topography extends the measurement range from the four points a few millimeters apart that is offered by keratometry to a grid of thousands of points covering the entire cornea. This procedure takes place within seconds and is painless. 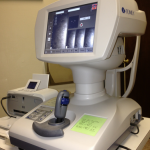 We use the cutting edge digital imaging technology to access the eyes at Premier Medical. Many eye diseases, if found at an early age, can be treated successfully without loss of vision. Your retinal images will be stored electronically. 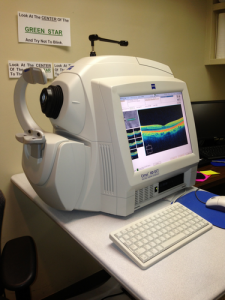 This allows us to have a permanent record of the condition and state of your retina. This also allows us to detect and measure any changes to your retina as eye conditions, such as glaucoma, diabetic retinopathy and macular degeneration are diagnosed by detecting changes over a period of time. 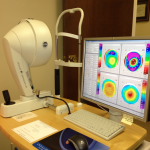 This process allows your eye doctor to evaluate the retina and the health of the back of your eye. It is critical to know the health of the retina, optic nerve and other retinal structures. The digital camera snaps a high-resolution picture of your retina. The picture shows the health of your eyes and is used to track any changes in your eyes for future eye exams. Optical Coherence Tomography scan (known as an OCT scan) is the latest advancement in imaging technology. Much like the ultrasound, this diagnostic technique employs light rather than sound waves for a higher resolution picture of the structural layers of the back of the eye. Similar to a CT scan of the eye, a scanning laser used to analyze the layers of the retina and optic nerve for signs of eye diseases. It works using light without radiation and is essential for early diagnosis of glaucoma, macular degeneration and diabetic retinal disease. With the OCT scan our physicians are provided with color-coded, cross-sectional images of the retina. Detailed images are revolutionizing early detection and treatment of eye conditions such as wet and dry age-related macular degeneration, glaucoma, retinal detachment and diabetic retinopathy. The OCT scan is a noninvasive and painless test that takes about 10 minutes. This test measures how much “side” vision you have. It is a painless, straightforward test and does not involve eye drops. Lights are flashed on and you have to press a button whenever you see the light. Your head is kept still and your chin is placed in a chin rest. The lights are bright or dim at different points in the test and some of the flashes are to see if you are concentrating. 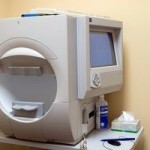 The test takes 15-45 minutes and each eye is test separately. The front window of your eye, the cornea, has 5 layers. The inner layer is called the corneal endothelium. This layer maintains the hydration of the other inner layers by acting as a pumping mechanism. This can fail leading to a cloudy cornea and a condition called Fuch’s endothelial dystrophy. This layer can be replaced surgically. We monitor the health of the endothelium using a specular microscopy to determine when and if surgery will be necessary. The quality of vision is greatly affected by the clarity of the cornea.